Genetic anticipation is a phenomenon in which the signs and symptoms of genetic conditions become more severe and/or appear at an earlier age, as they are passed from one generation to the next. Genetic anticipation is an unusual type of genetic inheritance in which there is a progressive increase in the severity of a mutation, and sometimes in the probability that a given mutation will result in a disease, as it is passed from parents to their offspring. The full mechanism underlying genetic anticipation is largely unknown, but the phenomenon has most notably been associated with a particular type of mutation, known as trinucleotide repeat expansions. However, other proposed explanations for this phenomenon include telomere shortening and non-genetic factors, such as increased surveillance for the signs and symptoms of a particular disorder. Trinucleotide repeats are simple repetitive sequences of 3 nucleotides that follow the pattern of CNG, where N can be any nucleotide. They can be found throughout the human genome, within both coding and non-coding sequences of DNA. It is generally thought that the unusual structural features of these repeat sequences make them unstable and prone to replication errors during cell division. It is also believed that these repeat sequences are able to form what is known as ‘slipped-stranded DNA’, which is the misalignment of two complementary strands of DNA during replication. This misalignment allows the trinucleotide repeat sequences to be looped-out and trapped within hairpin structures (in one of the strands). This hairpin structure is thought to stabilize the misaligned DNA strands and after a further round of replication, the result is an increase in the number of repeat sequences (a repeat expansion) if the hairpin formed on the ‘lagging’ strand of DNA, or a decrease in the number of repeat sequences (a repeat contraction) if the hairpin formed on the ‘template’ strand of DNA. These ‘slipped-stranded DNA’ structures are transient and their formation can occur during any genetic process that involves the separation of DNA into single strands, including DNA replication, repair and recombination. If the expansion of these repeat sequences occurs within a coding section of DNA, then they are able to affect the structure and function of the protein that is translated from that region. This can result in a loss-of-function or a gain-in-function in the protein, both of which can be harmful. It is not yet fully understood how the expansion of these sequences in non-coding DNA is able to cause the pathogenesis observed in some disorders, but possible explanations include protein sequestration, RNA degradation, and chromatin silencing. The expansion of repeat sequences is a progressive process and as the number of repeats increases the more likely it is that further replication errors will occur, and that the number of repeats will expand even further. 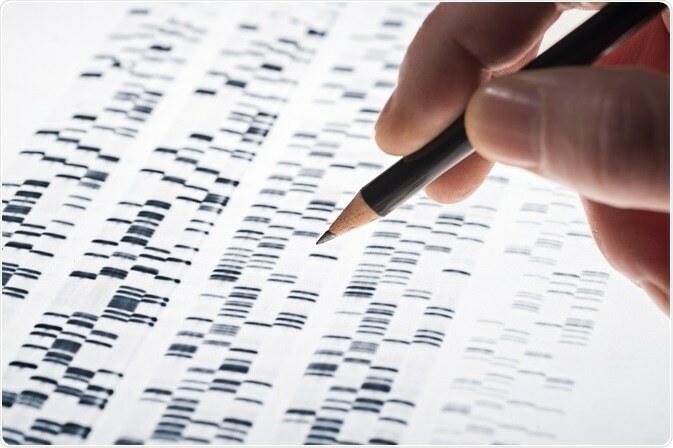 It is this continuous expansion of repeat sequences that alters gene expression and results in a more severe phenotype, as the mutation is passed from one generation to the next. An example of this is seen in Huntington’s disease, which is caused by an expansion of the trinucleotide sequence CAG in the IT15 gene. The age of onset of Huntington’s disease correlates with length of the CAG repeat and the greatest changes in the number of repeat sequences are seen with paternal transmission of the gene.